With more than 70 reviews from trusted Amazon buyers and a rating of approximately 4 out of 5 stars, the Boss B248 Ergonomic Kneeling Stool is a fusion of ergonomic style and comfort, promoting a posture that’s conducive for work. This particular model is a creation of Boss Office Products, currently one of the most trusted brands in the industry today. Other than ergonomic office chairs, the company also sells office tools to make your work-life easier. Measuring at 26 by 19.5 by 25 inches, it isn’t surprising that the product only weighs 20 pounds – light enough to be carried around the office. The frame is made of thick steel tubing that guarantees durability and balance. Item comes with a simple, easy-to-follow instruction manual to help buyers put it together. The design is simple, straightforward, and very professional. You can put it in any room in the office and the kneeling stool would blend perfectly, making it ideal for all types of work! The steel tubing creates a sturdy chair capable of maintaining balance and keeping users supported even under heavy weight. The padding offers sufficient bottom and knee support to keep you comfortable through hours of use. It manages to retain its original shape after every use, ensuring that you’ll achieve the same level of comfort without worrying about padding wear and tear. The product boasts of an ergonomic design that straightens the spine and reduces discomfort of the back. 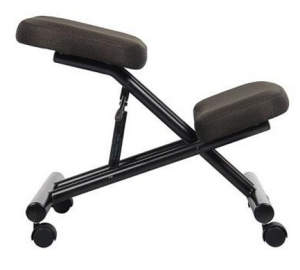 Removing any stress from the tailbone, you’ll find that this stool helps heal any swelling and muscular cramps that cause pain during movement. Studies have proven that the use of ergonomic chairs like the B248 helps increase the productivity of employees. This is because the discomfort resulting from bad posture is discarded, allowing users to simply focus on what needs to be done. Your biggest problem in ordering this product is that it must be shipped separately from other orders because of its size. 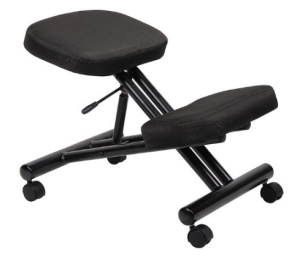 If you’re only buying the Boss B248 Ergonomic Kneeling Stool however, then this shouldn’t be a problem! Note that warranty details are available but not discussed in detail online so you’ll have to ask the seller directly! The B248 Ergonomic Kneeling Stool by Boss is a product recommended for anyone who spends their day sitting. With or without back problems, this kneeling stool should be able to help prevent and alleviate any aches and pains you have resulting from improper posture. Perfect for office workers, writers, call center agents, programmers, and more – the stool not only minimizes back problems but also enhances the quality of your work. To wrap it up, the Boss B248 Ergonomic Kneeling Stool is an excellent product to have in the office – especially if you want workers to remain productive and creative during the weekdays. Large companies who want to keep their employees happy will find that these stools are an excellent investment for long-term productivity. Simply stylish, ergonomically healthy, and reasonably priced – it isn’t surprising that the model gets a total of 9.5 out of 10 stars from our review.